Fifty-three years ago Oakhill Baptist church was conceived in the minds of a small group of people interested in forming a Southern Baptist Church in Oakhill-Melody Hills area. C.E. Wiley, area missionary and church planter, set up a preliminary meeting. On Sunday afternoon, January 24, 1960, this group met in the home of Mr. and Mrs. John Hughes. Dr. E.H. Moore, State Executive Secretary was their guest speaker. At this meeting a seed was planted and a dream was born. In June on that same year the group met with the Missions Committee of the Keck Avenue Baptist Church. In that meeting the committee expressed interest in sponsoring the new work. It became official shortly thereafter. On July 10, 1960 Oakhill Chapel was formed with 25 in attendance. In September of 1960, Rev. Paul Bowles was called as the mission’s first pastor. He served a two year term. During his pastorate, with the assistance of Keck Avenue, the mission purchased its first permanent property and began worshipping there in August of 1961. Then in March of 1963, after a five month interim by Rev. William Weedman, the mission called its second pastor, Rev. William Tucker. It was under Rev. Tucker’s leadership that the mission purchased the adjoining property at the corner of Oak Hill and Bergdolt Roads. 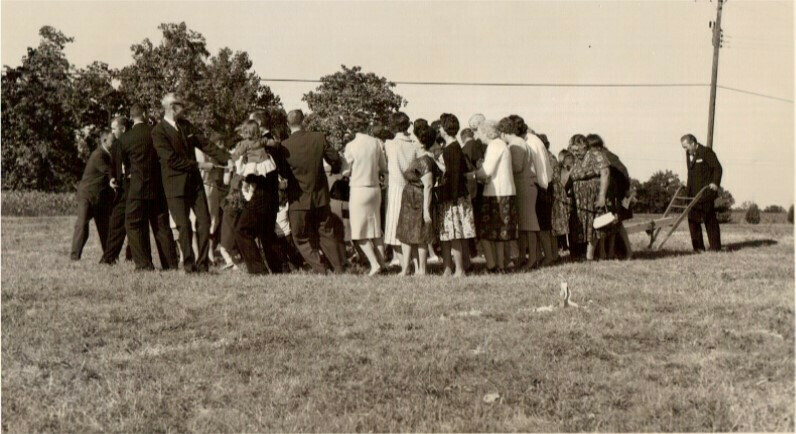 The dream finally became a reality on October 6, 1963, when Oakhill Chapel was organized in a constituted Southern Baptist church bearing the name Oakhill Baptist Church, with sixty-eight members. The new church, eager to move ahead in the Lord’s work, broke ground in the September of that year for a new building on the newly acquired property. Rev. William Carter accepted the call to be their pastor in August of 1964. The new facilities was completed and dedicated in April of 1965. In March of 1985, following pastorates by Rev. Joe Hasson (1974), Rev. Roy Jones (1977) and Rev. Irvin Parrett, iterim (1977 and 1984), the church called Rev. Glen Flowers. Under Rev. Flowers’ leadership, the church continued to move forward and grow. Once again, true to the spirit in which it was born, the Oakhill Baptist Church placed yet another milestone in its ever expanding dream. This time the members took the biggest step of faith yet taken as they embarked on a “Together We Build” program to expand educational facilities and remodel existing space in order to reach more people. The construction was completed in January 1988. The next ten years the church continued to serve the Lord by being a witness in the Evansville area and supporting missions both locally and around the world. In 1997 the church once again followed God’s leading to build. In 1998 they completed and dedicated the second addition of the educational space. This addition was built with cash and much volunteer labors by church members. In 2000 the church saw a need to enhance their ministry to children. They decided to offer a weekday childcare ministry. In April 2000 this ministry started with a Summer program to kids of all ages. The OHBC Childcare continues to be a vibrant ministry that seeks to care for and educate children in a Christ-focused environment. Today, they care for over 100 children daily. After faithfully serving the church for 21 years Rev. Glen Flowers retired from Oakhill Baptist Church. The search was started for the next pastor and in May of 2006, Rev. Alan Scott was called. In a little over a year it was clear that God was still working in an through the people of the church. It became apparent that another building had to be built to accommodate the growing church. In early 2008 a multipurpose worship and education space was begun. The building was dedicated October 2008. This new facility allowed for expanded worship attendance, new bible study groups, dedicated student ministry space, enhanced Children’s ministry programs, and new ministry programming like Upwards sports ministry. Between 2006 and 2014 the worship attendance at Oakhill has more than doubled. They have also been dedicated to missions giving; donating over $100,000 to local, national, and international missions each year for the past several years. The church has also gone on numerous mission trips to New Orleans, the Texas Gulf Coast, Inner-city Memphis, and Indianapolis just to name a few. The Church also added staff members as it has grown. The church currently has five full-time pastors, two paid ministry directors, and a four ministry support staff. Along the way the Lord begin to give Pastor Alan a vision for reaching people in the local mission field. After much prayer and planning, the Life Change Central Ministry was formed. Early on it was primarily focused on the Oakhill Food pantry, which had been operating for many years out of the garage on the backside of the property. In August 2010 Oakhill was led to partner with Trinity Missionary Baptist Church, which was a struggling church not far from Oakhill. They became Oakhill Baptist Church: Trinity Campus. This allowed us to build a new food pantry building almost twice the size of the old garage which was completed March 2011. This new food pantry allowed for more streamlined service and for a one-on-one experience with clients. The OHBC Food pantry served over 2000 people in 2012 alone. Oakhill Documentary from Oakhill Baptist Church on Vimeo.